Our beloved birds and other parts of the natural word are, of course, highly impacted by the changes in climate that are underway and they are expected to be challenged for survival if the changes continue to magnify. On the same day that the IPCC report was released, we at the Boreal Songbird Initiative also published a new report that tries to cut through the bad news of climate change. We wanted to show the positive opportunities for ensuring the survival of birds of the Boreal Forest of Canada and Alaska in the face of a rapidly changing climate. Fortunately, the solutions to help birds also help keep carbon out of the atmosphere and also protect other species including threatened animals like woodland caribou and Atlantic salmon. 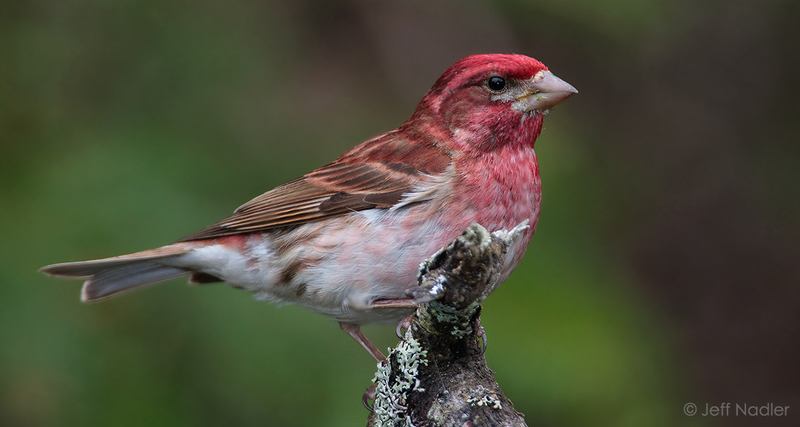 The report, “Conserving North America’s Bird Nursery in the Face of Climate Change” summarizes the most up-to-date science that predicts where individual bird species will occur in the future based on different climate scenarios. Using this information, the report then details the three ways in which current land-use planning and conservation will need to proceed in order to give birds the best chance for survival over the next hundred years. First, birds will need to have healthy populations spread over wide areas today in order to survive the stresses expected from climate change and be resilient enough to have individuals that can shift their ranges generally northward over the coming decades. Second, birds will need to have suitable, intact habitat in the “climate corridors” through which their future populations will be forced to move into as conditions worsen in their current range. Third, certain portions of the range of some birds are projected to remain relatively climactically stable into the future. These areas are termed “climate refugia” and ensuring as much of the habitat in these climate refugia remains healthy and intact is crucial for the survival of many bird species. 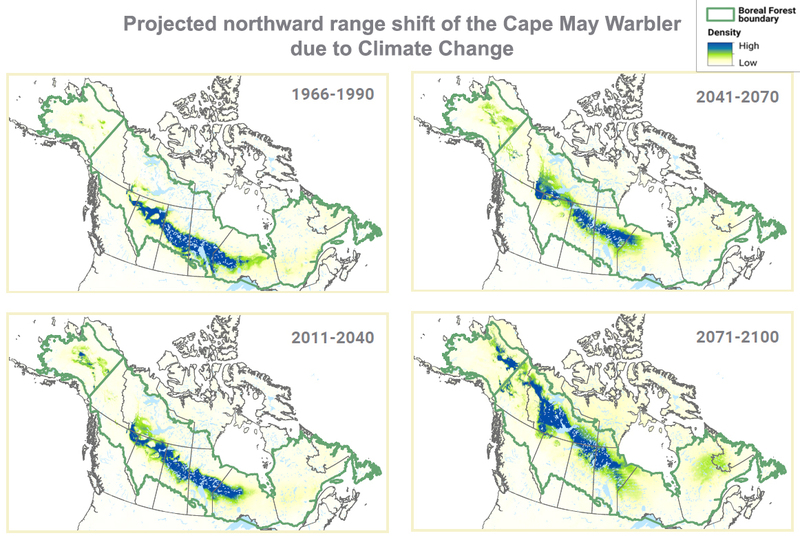 One of the maps from the report showing the projected movement of the Cape May Warbler's core range over time. In the report, currently intact areas of boreal forest in Canada and Alaska are mapped and overlaid with current ranges of birds, the landscape of climate corridors through which birds will be forced to move in the future, and projected climate refugia. It’s probably obvious that large scale land protection efforts will be needed in all three categories. The good news is that across Canada’s Boreal Forest region there are efforts underway, led by Indigenous governments and communities to protect these critical landscapes. Also good news is that the protections of these areas will help to keep carbon out of the atmosphere and allow forests and peatlands to keep storing more carbon from the air. As Canada moves closer to the 2020 deadline of protecting at least 17% of its lands to meet the so-called Aichi target commitments of the Convention on Biological Diversity, it is clear that protecting lands for birds as described in our new report will be crucial. The federal governments recent (spring 2018) budget that allocated $1.3 billion over four years for nature conservation is a strong step to help achieve this goal. Now we hope provincial and territorial governments will also step forward to work with and support Indigenous land-use plans and protected areas proposals that will be at the core of ensuring a bright future for birds, other wildlife and plants, and of course, the people who live in Boreal landscapes.